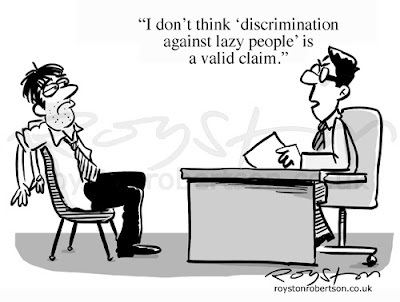 "I don't think 'discrimination against lazy people' is a valid claim"
Time for another in my occasional series of cartoons that predict the future. And I think this must be the best one yet. The evidence, above, is a cartoon from a careers textbook on the subject of job interviews from 2007. It accompanies a chapter called Equal Opportunities Issues. Ha ha, look, I made a ridiculous joke! That could never happen! Fast forward to 2010 and we have a news story which broke this week: The word "reliable" in a Jobcentre advert was removed as it "may discriminate against the unreliable". UPDATE UPDATED (1/2/10): Voting has now closed. The winner will be announced in the March issue. 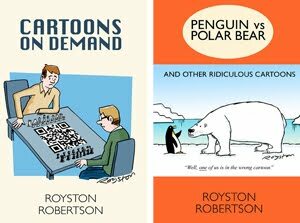 The caption options for Beat the Cartoonist are now on the Reader's Digest website. As usual, they are my original caption (anonymously, of course) along with three captions submitted by readers. 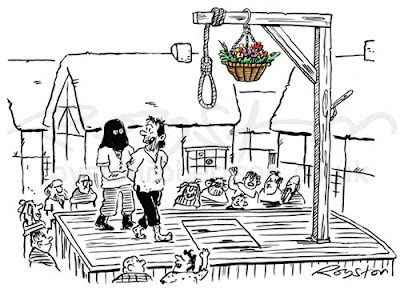 "Hanged for putting a plastic bottle in the dustbin. See what happens when you vote in the Green Party?" The Britain in Bloom entry lacked sensitivity. "You should have read my file. I have hayfever!" The last time I was in the competition, my caption was the winner, although overall the readers are very much in the lead! 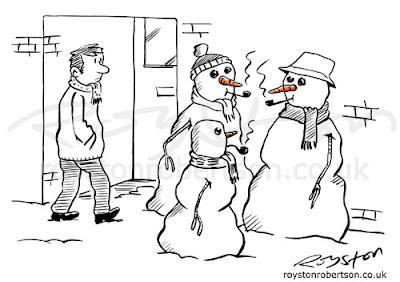 Here is yet another snowman cartoon, just as the ice is melting (around here anyway.) This can be seen in the current issue of The Spectator. Someone asked me if that's an underage smoker at the front. He does look a bit small. I think I just ran out of snow. I drew this last summer so there wasn't much around. Either that or it's conclusive proof that smoking stunts your growth. 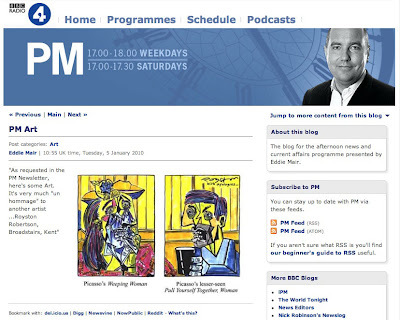 Radio 4's PM Blog was looking for some free art, as a bit of a joke after the BBC was criticised for using licence-payers money to buy art. So I sent them some. Click the image to enlarge or go here. The cartoon was originally in Private Eye back in September. 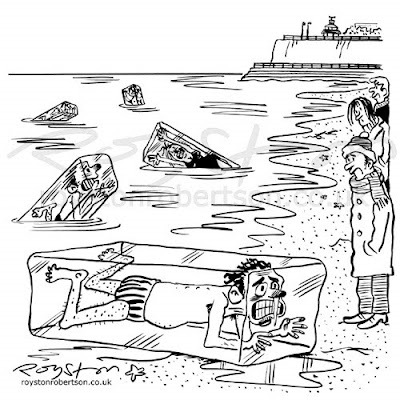 As is the case with many UK seaside towns, there is a tradition here in Broadstairs which involves brave/foolish people swimming in the sea on New Year's Day. Needless to say, I do not take part, the English Channel in January does not appeal, but I do tend to go along to watch/laugh. This cartoon was drawn to illustrate an article on the topic which appears in the current edition of Isle, a local listings magazine.